A couple of you guys asked this the other day and I was planning on doing some extravagant piece but I think something short and sweet will suffice. The question was, "How do I paint the purple on the Marines?" It's simple really. This could go for just about any color really, in fact, I used the same approach as when I paint the red on my Saim-Hann. The new GW washes have made this process even easier for me since I had to make my own before actually giving in and buying a set of them. I prefer spray primers when I'm painting a bunch of guys at a time but I'll brush prime my individual models. I made sure to find a black spray that matches my black brush paint exactly so both can be used interchangeably. I don't have to worry about the two blacks being different when I use them on the same model. 2. Basecoat with color of choice. The real trick with this part is to find a base color that is opaque. That way you only have to paint it once. The more layers you do, the more likely you're going to start obscuring details and the longer it's going to take to paint each model. For this project, the original color on the model sent to me by my client used a "mixed" color made from 2 other colors. Virtually impossible to duplicate on a mass scale. I had to do a ton of searching to find an exact match and have it be opaque as well. I ended up getting a near perfect match in a semi-opaque purple so it saved me tons of time and mixing. For this project, I used Leviathan Purple for my shadows. On the picture above, the orange lines represent where it was applied. I didn't paint it all over the purple areas, just in the recesses. 4. Apply highlight if desired. The real trick with this part is to find a highlight color that is transparent. Again, just like had to hunt for the purple, I had to hunt for a color to use as the highlight. I lucked out with this one as well and found a near pefect match in a transparent color. The reason I like a transparent color here is that it makes it much easier to blend it into the existing base color. The highlights were added where the green lines are in the picture above. When doing it like this, you need to start painting your highlight where it is the brightest and let it "fade" away. For example, his left hand... I start at the tips of the fingers and pull my brush stroke downward so that by the time I'm at the end of his finger, I'm just about out of paint and with it being a transparent color, the blend is perfect. Simple as that, no fancy tricks or anything else. UPDATE: Since this post is older, I decided to go back and add a few more links to it in order to expand on some of the topics covered here. Sounds pretty fancy to me! That highlight technique must take a bit of practice, or at least I think it would for me. Straight forward and very effective - good work Ron! Thanks for sharing and posting the diagram with the highlight & wash areas indicated; its a very useful resource. Thanks for the tips Ron. I really need to get back to painting so stuff. Ofcourse people at the FLGS are talking about playing some Epic and since I have 20 year old epic pieces that have never really seen the table I am tempted. I had tried all over washing but had not thought of using it as an inverse highlight. Glad it helps guys. I figured I would show you where I highlight and shadow otherwise it would just be a bunch of text describing it. The Inner Geek: It goes much faster than you think once you get the hang of it. You really only have to highlight one guy and then copy that highlight pattern on the rest of them. Should be noted that anytime you need to take an opaque paint to a translucent paint all you need to do is mix in a % of matte medium (where % is how translucent you want the color to be). Also matte medium is a drying retardant that allows you to wet brush blend highlights easily. You can get the same effect with gloss medium, though I prefer matte, Dullcote seal, then gloss paint any shiny surfaces that need it. Good point Charles, I've never really experimented with the stuff and the hobby... only in my art days way back when. 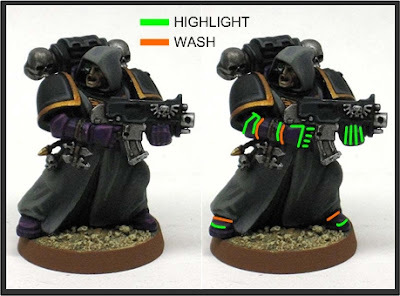 I like your work in general and perhaps this is a decent scheme; however, the entire model, save the locations in which you "highlighted" after the wash, looks black! And why highlight in those locations...seems a bit arbitrary. Perhaps purple was not the right color to complement black for which the picture does not serve to demonstrate your scheme well in this instance. Anon: Thanks for the comment. I think the looking "black" may be more due to the lighting in the picture. Those edges highlighted are all of all the armour edges that are visible. It's not as complex a scheme as a zenithal approach would be. This is more of a tabletop look for effect. While the exact color choices may not be the best, the idea of the post was to demonstrate the idea of highlighting and the areas I would do it (both apply a quick wash and line highlight) when painting something to a quick tabletop standard. I'm going to give this a go, I'm doing an as yet to be named custom chapter which are predominantly purple so this is perfect. The green and orange lines are particularly useful. ieuan: Good to hear. The idea behind the lines was to show where I apply the shadows and highlights as sort of a map for folks to follow. Hope it turns out well for your chapter!